Traditional folk shoes meet sneakers for a relaxed, casual look. These fabric training shoes by Krüger Mädl feature traditional folk elements as well as a sporty, modern design. The separate toe caps and the perfectly colour coordinated strips right around the sole create an exciting twist to the elegant fabric with its fine web pattern. 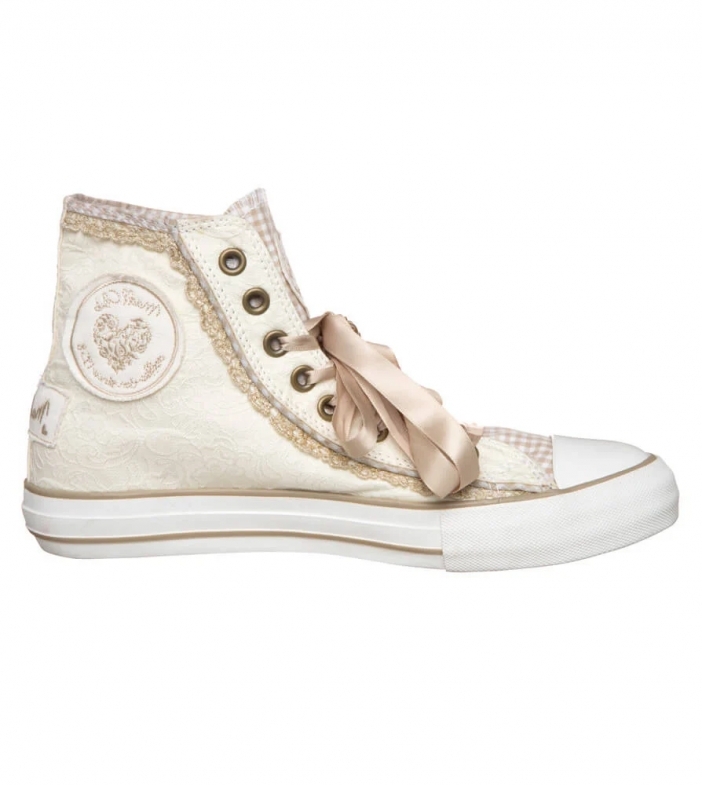 Gold, glittering lacy touches and satin-look braiding further highlight the shoes’ trendy appearance. Patches inside the ankles, on the heels and on the tongue of the shoes as well as the colour-matched stitching and the classic gingham check also recall aspects of traditional folk costumes. Regardless of whether these trainers are intended to add a cute touch to trendy jeans or add a youthful feeling to a feminine dirndl, the softly upholstered insoles will ensure that they’ll always be comfortable to wear. Super schöne Sneakers. Die Zunge ist leider etwas steif und legt sich nicht schön in Form. Vielleicht gibt sich das aber mit der Zeit. Toller Schuh, schöne Farben, angenehmer Tragekomfort. Tolle Ergänzung zum sportlichen Alpenstil.